I wish there was a different word for “negative die cutting” that didn’t sound so negative lol! Anyhow, I love doing negative die cutting and using negative die cut panels on my cards. 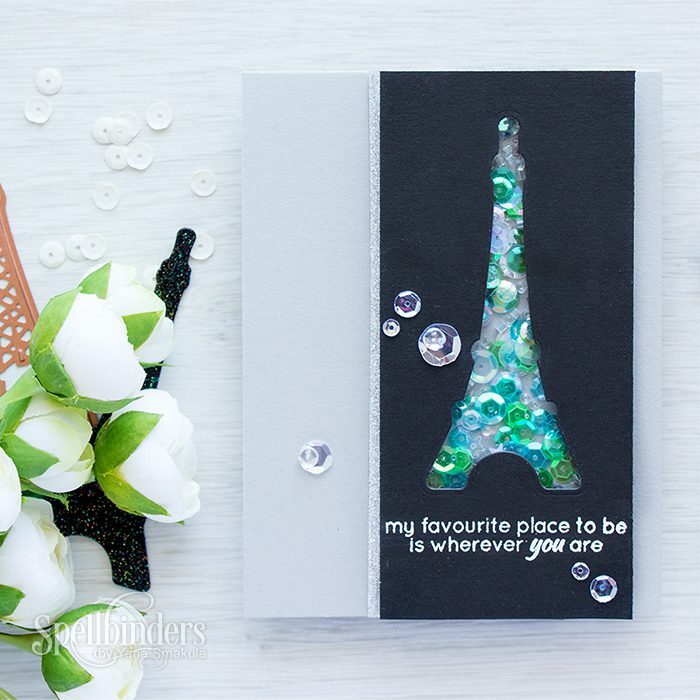 Today I’m sharing a travel shaker card using an Eiffel Tower die cut from the Ooh La La set from Spellbinders. 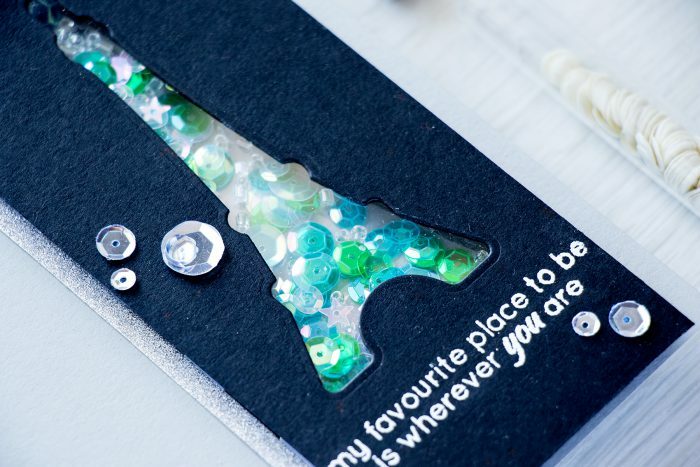 I’m using Prizm Die Cutting & Embossing machine to create this project. In case you haven’t seen it before, you might want to check out THIS video. Its a fun machine to take to a crop or any other crafty event, very light weight and does the job well. I die cut the Eiffel Tower image in a black card stock panel (I kept the positive die cut for another project), adhered a layer of clear acetate from the back of the negative panel, outlined the opening with thick foam squares, added a bunch of sequins (I used a fun mix from Lucy), closed that shut with another layer of acetate and adhered my shaker element onto a gray card base. 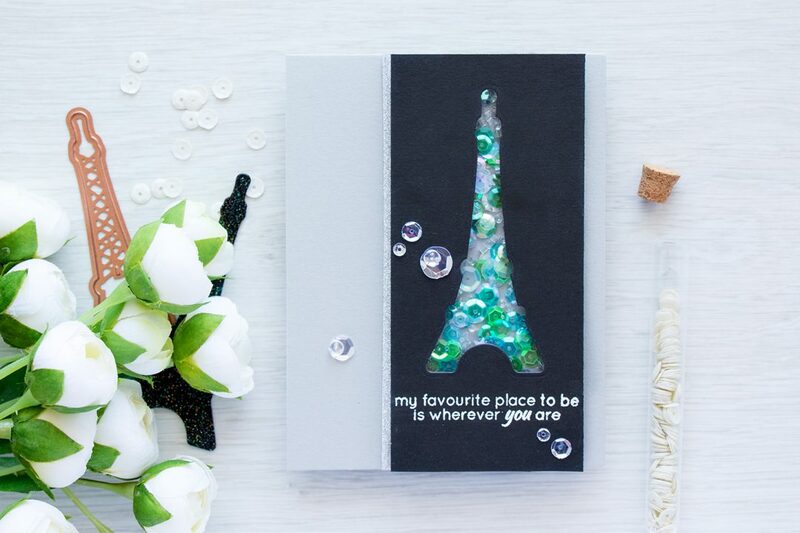 I forgot to mention that I also heat embossed a beautiful sentiment, my favorite place to be is where you are, in white embossing powder onto my black panel. I also added a strip of silver glitter tape and embellished my card with several clear sequins and drops from Pretty Pink Posh. Very sweet Yana – seemed like a quick card too (apart form all the little foam pieces – lol)! Thank you! Very nice card Yana, a lovely job!